Have a look at the video of the program held in India from 23rd January to 18th February 2013. 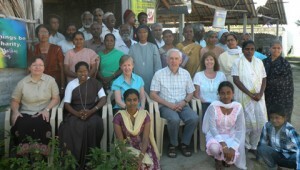 We conducted five courses in Salem (South India), in the school of evangelization (ISONE) of Fr. Panneer Selvaraj. In Calcutta we held 4 courses, organized by the regional secretary for the proclamation, Fr. Subhash Baroi. The participants were made up of pastoral animators in the region of West Bengal, some religious, priests and a group of young people from Prerona Bible School. This experience has been a very fruitful collaboration with the two Indians realities, and was also a highly spiritual experience. We experienced the continued presence of the Lord in the courses, and the participants felt a new love for the Word of God, and a renewed zeal for evangelization. You can see the photos!